In 2003, Mustard Seed Communities became aware of a troubling reality at the local landfill. The 13-acre area formerly known as La Union in Sosua, Dominican Republic, is located just a few miles from MSC's residential care program in Puerto Plata. That summer, MSC began offering bi-monthly meals to the people of La Union, who lived, worked, and subsided on the garbage dump. From 2008-2016, Mustard Seed Communities also managed a school to educate young members of the La Union community. The elementary curriculum focused on Spanish, Mathematics, and Faith Studies. These students left the dump to attend classes for 4 hours a day and received a wholesome meal. In 2016, the landfill was privatized and MSC lost access, closing the school and ceasing food distribution. As an organization, Mustard Seed Communities remains committed to uplifting and empowering the wider populations surrounding our homes. In light of these changes, MSC will evaluate the best way forward to continue serving this community. Mission Volunteers from St. Thomas More conduct a medical clinic at the school in Batey La Union. Christ in the Garbage Ministries (CIGM) Nicaragua began in 2004 in Managua at the main city landfill formerly known as La Chureca, which covered 38 acres and was previously home to approximately 1,500 people, including many single mothers and their children. CIGM began delivering periodic food packages and praying with the residents. 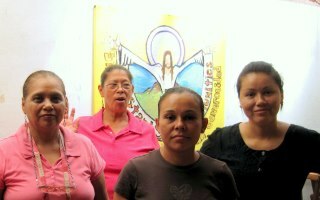 CIGM in Nicaragua is now focused on helping women learn a marketable skill that will offer them hope for the future. The free vocational training program begain in 2006 as a sewing center. The remodeling and furnishing phases were driven by a dedicated group of volunteers from St. Brigid Catholic Church in Atlanta, Georgia. The center has since moved locations and evolved into a more comprehensive Resource Center (Centro de Recursos). The center now offers additional classes in Baking, English, and Mathematics. Childcare services are provided while mothers attend classes. As many as 20 women at a time take courses in the various specialties offered at the Resource Center. Christ in the Garbage Ministries continues to provide monthly food packages for the families and community members of greatest need in the area..